N. 63rd Street in Milwaukee after recent snowstorm. School cancellations, combined with temperatures too cold to spend time outside, presented families with unusual challenges. WUWM's Education Reporter Emily Files reports. Snow and brutally cold temperatures prompted many Wisconsin schools to cancel classes most of this week. Milwaukee Public Schools are back in session Friday after being closed five school days in a row, starting Jan. 25. When temperatures dropped to minus 20 degrees Wednesday, parents cooped up with their kids at home had to find creative ways to burn energy. Catlin says when her fifth grader started getting antsy from too much time indoors, she sent him to the attic to pedal on a stationary bike. “I think people are trying to think of creative ways to keep kids busy,” Catlin said. Wauwatosa schools were closed Monday, Wednesday and Thursday. In Milwaukee, kids were home from school for five days in a row. The closures raised concerns for teachers in high-poverty schools. Jason McClelland is a new teacher with HOPE Christian, a network of private voucher schools in Milwaukee and Racine. “I know if there’s not school, some kids are going to go without eating,” McClelland said. Jason McClelland is a teacher at one of HOPE Christian's Milwaukee schools. 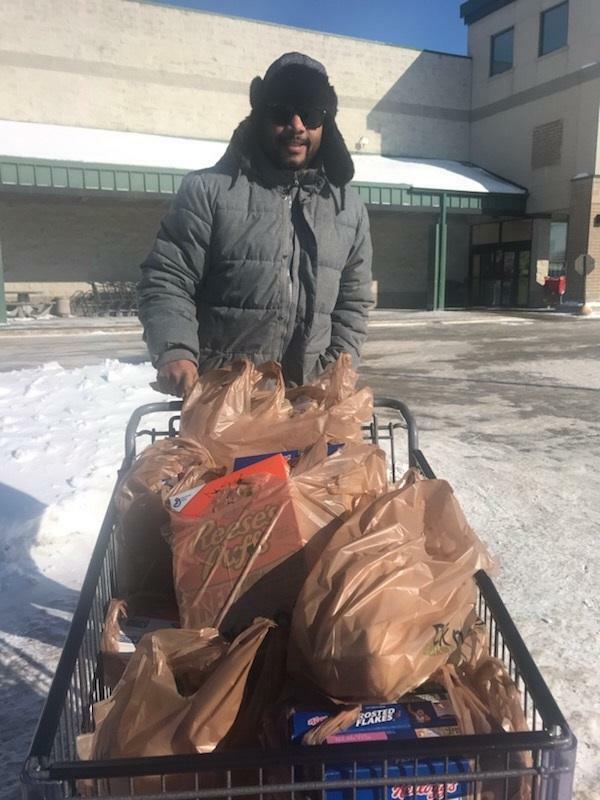 He delivered groceries to students and their families during the multi-day school closures. At his school on Milwaukee’s north side, the student body is 100 percent low-income. McClelland decided to offer free meals to kids who might need it. He, his wife, and a coworker went to a local fast food restaurant and put out a call on social media. “I put up a status on Facebook saying, ‘Hey, I’ll be at Popeyes from 7:30 to 9 just giving out $2 boxes of Popeyes chicken to fill the void so that kids don’t go without [eating] that night,' ” he said. He says they gave out 30 boxes of chicken to students. The next two days, in the bitter cold, McClelland and his coworker delivered cereal, milk, frozen pizzas other food to dozens of more families. McClelland won’t be doing any more grocery deliveries this week. Most area schools are back in session Friday after the prolonged break. Milwaukee parent Holly Haebig has two children in MPS schools. She worked from home this week. Haebig says everyone is ready for a break in the cabin fever. Wisconsin Gov. Tony Evers declared a state of emergency on Monday due to severe winter weather. Editor's note: This piece was originally published Jan. 29. Updated on Jan. 30 6:35 p.m.
Milwaukee Public Schools are closed Thursday due to extremely cold weather. Temperatures are expected to stay below zero through Thursday. Across the greater Milwaukee area, businesses remain closed, some flights are canceled and thousands of people are without power as We Energies works to fix issues. Amy Jahns, a spokesperson for We Energies, says people in Sullivan, Racine and the town of Erin are impacted by wires snapping Thursday morning. “The weather with the frigid temperatures are causing our wires to constrict and causing them to snap off. And so we are arriving and finding wires down on the scene,” she says.